with Proven pedigrees AND WE OFFER A SIX YEAR GENETIC HEALTH GUARANTEE ON ALL OF OUR PUPPIES WE SELL! 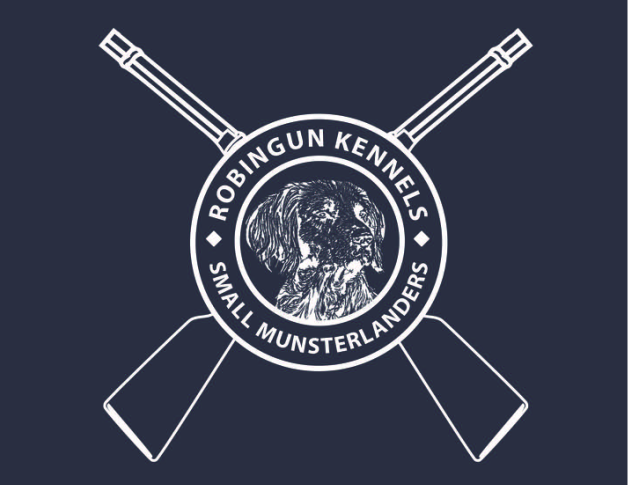 Robingun Kennels' goal is to breed only the BEST Small Munsterlanders possible that are true to the German FCI standard. We have made sure that we own only the best breeding stock that are healthy, proven hunting dogs and good companions in the home. We have imported dogs from five countries in Europe to insure we only have the healthiest and best breeding stock that you will find in the U.S.
All of our dogs are hunted, trained and tested by us or our assistant, Aleah German, as well as they are pets in our home. We also have a large heated/cooled kennel facility for our dogs when they are not in the house with us. ALL of our breeding stock is evaluated in at least two levels of the AKC and/or the NAVHDA testing systems which surpasses the minimum Natural Ability test requirement to be approved for breeding by the SMCNA. A dog's temperament is equally important to us as their hunting ability so we strive to produce truly versatile hunting dogs that can not only hunt but be a lifelong member of a family. In addition to providing a six year health guarantee on all of our puppies, we also provide each owner with a puppy training manual we wrote and we offer our advice and assistance in training the puppy. We will also handle the puppies we sell in their NA test if requested. The puppies we raise are evaluated at 5 and 8 weeks of age for their conformation and temperament using the proven Pat Hastings' method. We do our best to match puppies with the prospective owner's hunting/training experience and their personal lifestyle. Each litter that we whelp is planned and genetically calculated in advance with the help of our mentor and partner, Tom McDonald, because we are committed to producing the best puppies possible and because we care about the breed's health and the future genetics of the breed here in the U.S.
We only breed the highest quality Small Munsterlanders that have better than average test scores, natural hunting instincts and stable temperaments in the home. We regularly hunt our breeding stock on wild birds/game and we are always happy to have visitors see our dogs work in the field/water. We believe that breeders can't really promise great hunting dogs if they don't hunt their dogs and know how they perform in the field on wild game. We want our puppies to go to the best homes possible so we ask prospective buyers to fill out a questionnaire before we will agree to sell them a puppy and we only sell our puppies to hunting homes. Puppies we sell are well socialized with people and other pets and they will have their first shots, be wormed, micro-chipped and dew claws will be removed. We are the only SMCNA breeder who has always offered a six year genetic health guarantee for every litter we have sold. Our puppies sell for $1800 - $2200 depending on the pairing. We evaluate all of our puppies' temperament and conformation before they are placed with their owners as well as our litters are raised in our home, well-socialized and introduced to gunfire, birds and water. All of our puppies will be registered with NAVHDA and the SMCNA as well as RGK pays for one year of membership to NAVHDA for our new puppy buyers. We sell to only responsible owners and utilize the "Breeding Restriction" registration offered by the NAVHDA registry. The puppies we sell are required to test in the NAVHDA Natural Ability test before they are 16 months old. 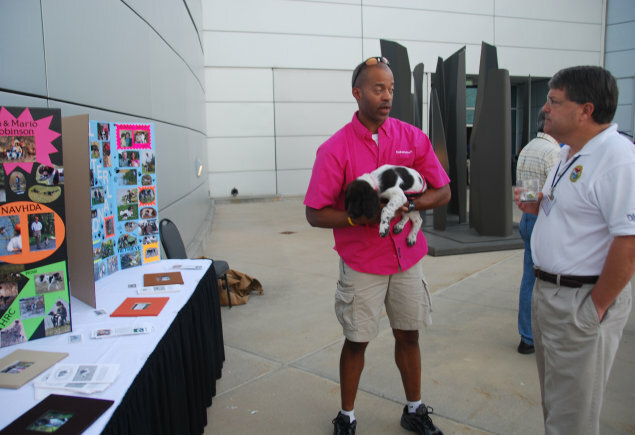 We are happy to train and handle the pups in the Natural Ability Test for the owners if requested. NAVHDA (The North American Hunting Dog Association) is the foundation registry and testing organization used for the Small Munsterlander Club in North America. By NAVHDA using a "standard" for testing purposes, Robingun Kennels can compare our Small Munsterlanders with other versatile breeds. SEE THE TESTIMONIALS FROM SOME OF OUR PUPPY BUYERS AT THE BOTTOM OF THIS PAGE! We only sell our puppies to hunting homes and require that each puppy we sell is evaluated in the NAVHDA Natural Ability Test before it is 16 months old. Robingun Kennels chooses to test our potential breeding stock in not only the NAVHDA Natural Ability test (comparable to the German VJP test) but also the UPT (comparable to the German HZP test) or UT test at a young age. We believe that a truly versatile dog should not only have the natural ability to hunt but the ability, desire and cooperation to hunt in a variety of hunting situations that are measured in the UPT/UT tests. 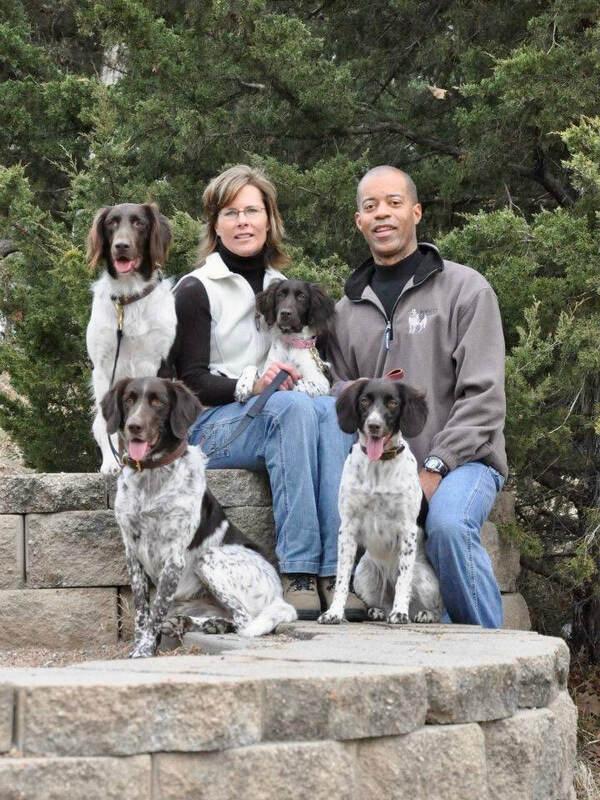 All of our breeding stock is evaluated in two levels of testing, which is not only a testimony to the inherited hunting traits of the dogs we own, but a testimony about the train-ability of the dogs we own and have produced. We have produced 100 puppies since 2013 and fourteen dogs we have produced have been approved for breeding by the SMCNA. Forty six puppies have been evaluated in the NAVHDA Natural Ability Test so far and 100% of those puppies have passed the test. Twenty-seven of the puppies earned a Prize I, twelve earned a Prize II and seven have earned a Prize III. We are proud of the fact that we test ALL of our dogs used for breeding in at least two levels of the NAVHDA and/or AKC testing system. We want to make sure we are breeding only the best dogs by measuring their inherited traits that are evaluated in the basic natural ability puppy test as well as in the upper level tests which gives us a better insight into the temperament and train-ability of our dogs. This way we have a complete performance evaluation on each of our dogs hunting ability and temperament before they are used for breeding. We also have our dogs' conformation evaluated by the UKC and/or IABCA and all of our breeding stock have earned Conformation titles for the breed as well as several of our dogs have won titles at conformation shows where they were judged against other versatile hunting dog breeds. Seven of our dogs (VC Joker, Gunnar, Nixie Rae, Zandor, Branka, Ukon and Tevah) passed two levels of the NAVHDA tests before they were 25 months of age. Three of our dogs have qualified for the NAVHDA Invitational which is the highest level of testing in the NAVHDA system. Only those dogs that have achieved a Prize I in the Utility Test are eligible. This limits the entry to exceptional animals who have demonstrated a high level of training and tests their skills in the advanced work. 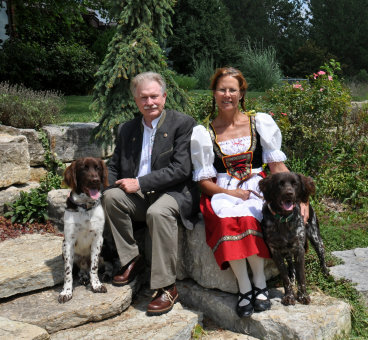 Since 2012 Robingun Kennels and Wolfsburg Kennels has imported 14 dogs from five different European countries. Six of those imports are old enough and have met our criteria for breeding. Three of our imports have sired or whelped a litter for us. We have taken special care to research and visit each breeder looking for only the best breeding stock in the world from proven lines to diversify and improve the genetics of our breeding program. We are very thankful for the advice and lifelong relationships we have formed with the European and American breeders who have sold us their outstanding puppies. We encourage anyone looking for a SM puppy to use caution if a breeder is not a member of a recognized breed club. Breeders who are only NAVHDA members in the U.S. may not be reputable breeders who are held to any breed or health standards. & our dogs working in the field/water. Robingun Kennels has had the pleasure of working with some very satisfied customers who love their Small Munsterlander puppies! As trusted dog breeders, we focus on providing the best, most healthy pets to our customers. That’s why, among reviews of dog breeders far and wide, Robingun Kennels’ are overwhelmingly positive! Our dog breeder reviews are a testament to the care and attention we give to raising only the best possible hunting partners for our buyers that are friendly, loving puppies who will immediately become part of the family. "With our "D" litter pup the compliments never cease. Everyone exposed to him is amazed by his character and behavior, and he continues to amaze us with his hunting ability. 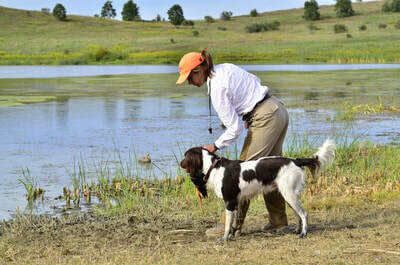 I would recommend Robingun Kennels to anyone interested in having an exceptional hunting dog." Paul M.
"Daisy Rye comes from Robingun Kennels and Pamela Robinson. Her dam is Etta and her sire is Aico from the Netherlands. Her nose is incredible! She uses the stealth method when hunting, intense and calculating every move. I prayed everyday when I learned Etta was pregnant that I would get a pup from this litter. I saw her within minutes of her birth. Pam held her in her hand and took a photo. Pam is an extraordinary breeder. She provided weekly updates, photos and videos. It was almost like I was there-almost!" - Victoria T.
Robingun Kennels is a member of the SMCNA Genetic Health Project, the SMCNA Cooperating Breeders Group and a licensed Commercial Breeder with the Nebraska Department of Agriculture.